As July 31, 2018, the deadline to file Income Tax returns for the Assessment Year 2018 – 2019, comes closer, the complexities and jargon behind whether or not Aadhaar Registration/ Enrollment ID (Aadhaar Number) has to be furnished/ linked become more and more relevant by the minute. Thankfully for us, the Delhi High Court has come to save the day. The Delhi High Court, on Tuesday in the case of Shreyasen & Anr. v. Union of India1 cleared all the hullabaloo regarding the “linking” and “furnishing” of one’s Aadhaar number which was previously mandated to file income tax returns. In its order, the Delhi High Court directed the Central Board of Direct Taxes (CBDT) to, at least till the period of March 31, 2019, either create a platform by amending the digital form or substituting the same to properly enable “opt out” from the mandatory requirement of having to furnish Aadhaar number. This effectively means that no Aadhaar Number, previously mandated (either the 12-digit Aadhaar Card registration number or the 28-digit Aadhaar Card Enrollment ID), will be required to file income tax returns. However, only a partial stay was granted by the Supreme Court in Binoy Viswam v. Union of India & Ors. for the purposes of Section 139AA(2) which talked about how every person who had been allotted PAN as on the 1st day of July, 2017, and who was eligible to obtain Aadhaar, would have to intimate their Aadhaar on or before a date to be notified by the Central Government failing which the PAN allotted to the person would be deemed to be invalid. However, the Supreme Court also stated that PAN cards of assessees, those who were not Aadhaar card holders, would not be invalidated. This led to a conflicting situation where on one hand, the CBDT had stated that linking was to be done only by March 31, 2019, but at the same time income tax returns could not be filed without quoting Aadhaar number. The differentiation lay in the fine print i.e. the difference between “quoting” one’s Aadhaar number versus “linking” ones Aadhaar number. Numerous litigations arose across various High Courts of the country including the Delhi High Court11, Punjab and Haryana High Court12, Madras High Court13, and the Kerala High Court14 all of which allowed the petitioners specifically, to file their income tax returns without “quoting” their Aadhaar numbers which the Income Tax department had said was mandatory and was different from “linking” the deadline for which had been extended. In this backdrop, the only solution that an individual could take recourse to non-quoting of their Aadhaar number was filing a suit and praying for the same outcome. The Shreyasen & Anr. v. Union of Indiacase is however, different in the sense that it not only orders the CBDT to create a platform by amending the digital form or substituting the same to properly enable “opt out” from the mandatory requirement of having to furnish Aadhaar number but more importantly it does not restrict its scope to the petitioners alone. In what is probably a staged rollout, there have been instances wherein some users are already being able to file their income tax returns online without quoting their Aadhaar Number. With the deadline to file income tax returns coming extremely close, SFLC.in is closely monitoring CBDT’s strict compliance with the Delhi High Court order; with sources confirming that the same is to take place for all users in the next 24 hours. 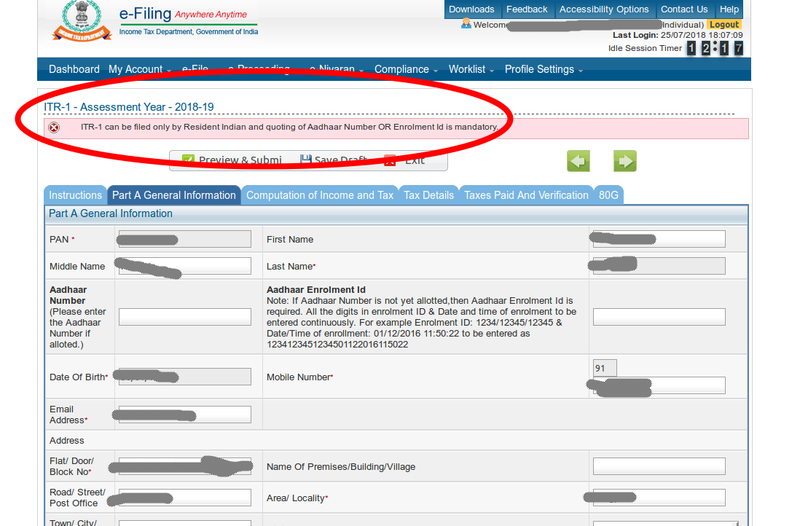 Please do note that at the time of publication of this blog post, quoting of Aadhaar Number is still mandated in our sample account hereunder.